Three detector the product is Descartes coordinate installation, suitable for shear wave velocity testing, engineering vibration field. Adherent form for the airbag coupling and electric suction cassette two. The maximum measured depth of no more than 130 meters. 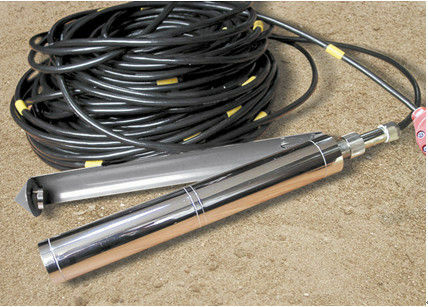 The Downhole 3 Component Geophone String is equipped with special tension geophysical cable length marking system, with high strength, good electrical conductivity, no rope and separate the length scale, any point can be in a variety of rock and soil in the caliber size of borehole by single hole measurement, waveform signal and can obtain clear, the series geophone natural frequency can be from 10Hz to 28Hz. Cable length according to the user requirements, product quality and reliable, stable performance, reasonable price, the implementation of three bags, one year warranty period.